The Gene Keys is a body of knowledge aimed to help transform our core self-beliefs, expand our consciousness and release our individual creative genius into the world. There are 64 universal archetypes that lie at the heart of the Gene Keys System. 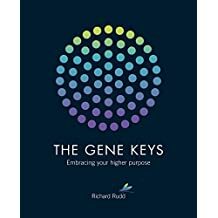 The founder of The Gene Keys System is Richard Rudd, author, poet and mystic who has studied with many great teachers in the East. He has traveled through the Himalayas, the Pacific, the Americas and the Arctic. It took him seven years to write The Gene Keys book which all came together in 2002. These teachings are rooted in ancient wisdom, and are an oasis of calm in our fast-paced world. Here you will find paths of self inquiry that challenge, question and enlighten you about your true role in life. I invite you to step gently into this wisdom and find the way that feels right for you. No matter what appears in your outer circumstances, every single human being has something absolutely beautiful hidden inside waiting to come forth — an incandescence — the eternal spark of genius that sets you apart from everyone else, yet unites you with all. Please join me on the 2nd and 4th Wednesdays as I open a space for us to explore these teachings. To get started, you will need a copy of your Hologenetic Profile which can be obtained from www.genekeys.com. The Profile is free of charge. If you are serious and continue on this journey, you will need The Gene Keys book which can be purchased on the Gene Keys website, noted above, or on Amazon. To learn more about what The Gene Keys are all about, please go to this page (https://teachings.genekeys.com/about/new/) and watch the 5 minute video along with: Journey: Begin the Golden Path – The First Step is Free. This video will explain how the Gene Keys came about. The next scheduled Walking Meditation will be Friday, MAY 3, 2019. Please arrive promptly at 9:00 a.m. We will begin with a few warm-up exercises to connect and ground with the earth and then proceed with our walking meditation. Breathing and connecting with nature ~~~ pure serenity! You will learn much about yourself and your busy mind. All are welcome to participate! *Enter at the Polo Field North entrance gate (Player/Service Entrance) off Buena Vista Blvd. Drive ahead along this drive and look for our group (and the sign) on the right side of the road.